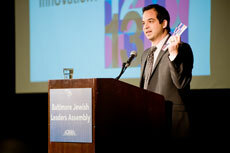 4/25/13- ACHARAI, the Shoshana S. Cardin Leadership Development Institute, put on the Baltimore Jewish Leaders Assembly last Thursday, April 18. Conferences like these are often wrought with pessimism, Jewish communal professionals bemoaning the challenges of engaging their audience and raising funds. However, BJLA 2013 was nothing short of exciting. The theme: Think Globally. Act Locally. The chairs: Liz Minkin Friedman and Rafi Rone. The format: BJLA Talks (“TED Talks” for the Jewish communal professional) followed by a day of Open Space Technology dialogue. Open Space is one way to enable all kinds of people, in any kind of organization, to create inspired meetings and events. In Open Space Technology meetings, participants create and manage their own agenda of parallel working sessions around a central theme of strategic importance. The BJLA Talks were what set the day in motion. Powerful. Productive. Up first, Neely Snyder, director of teen engagement for the Macks Center for Jewish Education, talked about building community one Jew at a time. She said local Jewish thought-leaders are mistaken if they think Jews aren’t interested in Judaism; in the 2010 Greater Baltimore Jewish Community Study, 91 percent of respondents said Judaism was important to them. In contrast, 46 percent said our local Jewish organizations are remote and not relevant. She said there should be less focus on programming and more on relationships. He said in Jewish Baltimore, led by organizations such as The Associated: Jewish Community of Baltimore, Baltimore is community-focused. He said Jewish Baltimore is more worried about the success of the community as a whole over any one Jewish organization. And that, he said, is what keeps the community strong. But Schneider noted that innovation need to be driven — not drive you. And, innovation does not mean use of technology, though sometimes that is a factor. Innovation is grappling with concerns in Jewish life such as identity, community, social justice and coming up with new and inspiring strategies and projects. Perhaps the most poignant piece of the BJLA Talks half-hour was a speech by “Mindy,” the Modern Orthodox mother of a son who came out of the closet. Mindy is a founder of JQ Baltimore, a group for Jewish parents and other family members of gay, lesbian, bisexual, transgender and questioning people. Mindy started her talk with one word, bold and brazen across the projector screen: Suicide. She said many Jewish LGBTQ people consider suicide because being gay is a shanda in the Jewish community. This, she said, has to stop. She admitted that she was shocked when her 19-year-old son delivered the news of his preference for men. All of her dreams for him were instantly crushed. She was forced to re-focus. It changed her life, she said. But what she was most struck by was that there were no resources for parents like her in the Jewish community. That is why she started one. A cool feature at the Baltimore Jewish Leaders Assembly was Poll Everywhere, which enabled participants to text responses to survey questions in real time. Here are some interesting questions and answers that were posed during the BJLA Talk session. Will your Jewish organization run photographs of gay or lesbian couples? How do you think someone becomes gay? For which age group in Baltimore are our Jewish organizations most relevant? The other 46 percent were divided among other cohorts.